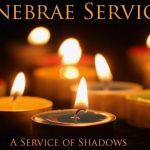 The Tenebr ae service is designed to provide an area and atmosphere of reverend worship when we can sit in quiet meditation and ponder on the awesome grace and love of God when He took on the form of man in order to pay the penalty due to us for our sins. Different readers read passages from the Bible that describe the unfathomable suffering that Jesus Christ went through in the garden of Gethsemane just before he was betrayed by Judas and taken before the religious and political leaders and eventually to be crucified. The service starts out with the church in candlelight. There are as many candles as there are readings, plus a white Christ candle. The readers go up one at a time, read their assigned selections, and extinguish one of the candles, until only the Christ candle remains. Then the Christ candle is put out, leaving the congregation in near total darkness—and near total devastation. At this point, the service ends. There is no benediction and the people leave in silence and wait for the sunrise service on Sunday morning signifying the resurrection.